A.L. 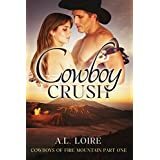 Loire is the author of steamy romance novels on Kindle. "Great story line, I was hooked. Harmony loves her job and her work ethic shows it. When she gets a chance to get out of the office and into the field, she's ready to jump at the chance..."
Please enter your email address and click the Follow button to follow A.L. Loire!